I have been a dedicated runner since my freshman year at Syracuse University starting in the fall of 64. This year marks the 49th year of my running life and in this spirit, I thought I would share some of my top recommendations and observations for those of you evaluating the merits of selecting my fitness passion as one you might want to pursue. These thoughts can serve as an introduction to the world I have called my “athletic home” for almost 50 years – and counting. 1. Running isn’t for everyone. Just because you see your friends doing something doesn’t mean it is right for you as well. Evaluate several factors prior to beginning a running program: Your weight – too many added pounds can injure your knees and ankles (back as well), your medical history – spinal and balance issues, your ability to stay consistent, your diet, your experience with exercise – since running is more advanced than other types of activities and finally, you readiness to learn a new and challenging skill. 2. Running takes discipline and consistency in order to work. 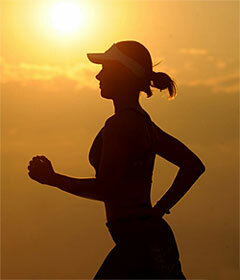 Planning to run as your foundational cardiovascular exercise is critical to succeeding as a runner. Weight loss is not a goal – it is an outcome of increased activity and improved eating habits – and improved lifestyle habits. Take the time necessary to decide clearly WHY you want to become a runner and develop a reasonable and flexible plan that you WILL follow. 3. Running is a lifelong pursuit and requires a strong desire in order to “keep going”. I find that this observation is one that we should take very seriously because this decision defines your “true desire” for the long term. Getting injured is not fun and many “repetitive use” injuries can result from running. Injuries can be chronic or acute and can last days or months. I have had mostly “soft tissue” injuries during my running life – strained Achilles tendons, plantar fasciitis (inflammation of connective tissue at the base of both feet), pulled and strained hamstrings, calves, quadriceps, and most difficult and painful of all – low back spasms that were most prominent before I began a weight training and stretching program in the early 90’s. My desire to work through injuries – and learn how to prevent them – was always my best attribute as a runner. I NEVER let injuries stop me! 1. Begin a resistance training program targeting the core muscles and legs. Resistance training can prepare the body for the stresses of running by strengthening and stressing the muscles that propel us as runners. Individual programming targeting individual needs are best – especially with specialized coaching (personal training etc.) – in order to prevent injury. 2. Join a running club and spend time with runners of all abilities to better ascertain your own ability and interest. Others have been through the process of transitioning to running and getting their input and support is a good idea. Don’t do something new like running alone – it can lead to shortcuts that can harm you. Slow and steady progress – and effort – gets the reward. 3. Don’t start a running program on the streets – or concrete – it is a bad idea and it can lead to serious problems. Identify places other than the roads that will work for you and stay on them while you learn what type of runner you are. If jogging and walking work for you then do that and find a park or other surface that will be convenient – and accessible – for you. Tracks at high schools and colleges are a great option as well. My favorite track is the one at UCI – it is forgiving and in a beautiful location. I will get back to this venue this year for speed work. 4. Run in the right equipment (clothing – loose fitting is best) and make sure you find the right shoes that will work for you. Shoes are every runner’s best friend and ally – or the enemy if they are not properly fitted. Find a store that specializes in serving runners and seek out their advice on what type and manufacturer will work best for your body type and weight. Each company has advantages and disadvantages so it is best to actually try them on and “check out the feel”. The toe box is important – too short or narrow – and you will get blisters and develop other types of problems. A thumb’s width at the end of the shoe will allow for swelling and expansion of your foot – and your feet DO expand – trust me. 5. Evaluate your diet and make appropriate changes so that it will support your new activity – and give you the energy to perform at your best. Eating is a common theme for all of us – not only the type of foods we eat but the quantity and timing of our meals. I always want to eat something before my runs and it generally includes some form of carbohydrate (cereal, bananas etc,) and light protein such as yogurt. I schedule my workouts for early afternoon so I prepare for that time accordingly. I also make sure I am drinking plenty of water daily to be properly hydrated and ready to consume more fluids as I run. I have a bottle of water that I refill as I complete my run. 6. Be conscious of what you “don’t know about running” and commit yourself to learning as much as you can so that your experience will be an enjoyable one. Runner’s World magazine is always a good source of running information. They cover every aspect of running – from beginners to elite competitors and beyond – to Olympic caliber runners who can serve as role models for “regular runners” and competitors alike. I am learning something new every time I run – whether it is about my goals or my current conditioning. This month I am starting a new year so I am “finding my way” right now and deciding what I want to do with my running. I am starting a yoga program at my gym this week and will be focusing on balance and flexibility – two areas that are important to help me become a more successful runner. This article has focused on some observations and recommendations I would make if I were starting over as a new runner sharing some important information that may help make your transition to running more effective – and fun. I will follow up this article with more of my thoughts on progressing and developing the skills and training techniques that help ALL runners improve and grow over time. I hope that for those of you who may be new to running – or are experienced veterans of the sport – that through efforts like this one, we can advance the art of running and have more and more people enjoy what I have enjoyed for almost 50 years!